Depending on the species, sharks are either born from eggs laid in egg cases or are born alive. About 100 shark species lay eggs in egg cases. This method of reproduction is called oviparity. Egglaying, or oviparous sharks, include bullhead sharks, such as the Port Jackson shark and the Zebra shark, and some carpetsharks and cat sharks. Unlike bony fish, which lay eggs that are fertilized outside the female's body, the male shark fertilizes the eggs within the female's body, and the eggs are then deposited in an egg case, which is expelled into the sea, where it attaches to algae or coral. The egg case is soft and flexible at first, but hardens in the water. The young develop inside the eggs, hatch, and leave behind an empty egg case, which often floats onto shore. An opening in the empty egg case is evidence the sharks hatched and dispersed. Sharks that are not born from eggs in egg cases are born alive. There are two ways in which live birth reproduction is accomplished among sharks. The most common way is called ovoviviparity. 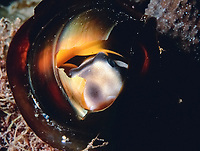 Ovoviviparous sharks have eggs that develop within the mother's body. The eggs are fertilized internally and the developing sharks are nourished by the egg yolks. The young hatch within the oviduct and continue to receive nourishment from the remainder of the egg yolk, still attached to their body, as well as from fluids secreted into the oviduct. 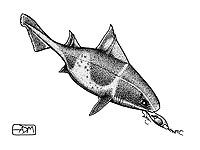 Some species of shark are cannibalistic, feeding on other eggs and embryos within the oviduct. Only a small number of these pups survive until birth. The young are then born live, and are fully functional. Most sharks are ovoviviparous, including great white sharks, mako sharks, nurse sharks, tiger sharks, and many others. The other live birth method is called viviparity. The eggs of viviparous sharks are fertilized within the mother's body, and the young are nourished by a placenta. The placenta is formed when the yolk sack comes into contact with the uterine wall. The placenta transfers nutrients to the young using the blood streams of the mother and babies, similar to the way mammal babies are nourished. The uterine wall also secretes fluids that are absorbed into the yolk stalk to nourish the developing pup. The young are then born live and fully developed. Viviparous sharks include bull sharks, whitetip reef sharks, lemon sharks, blue sharks and hammerheads, among others.